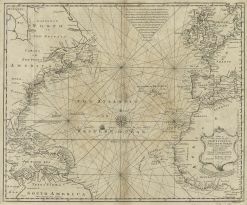 Title: A New & Accurate Chart of the Western or Atlantic Ocean Drawn from Surveys and most approved Manps & Charts. The whole being regulated by Astronomical Observations By Eman. Bowen. Geigrapher to His Majesty. Sub-Title: [lower right corner] Vol.II. page 3.